London, 1899: The City is shaken be heinous crimes, and the solutions are shrouded in mystery. Scotland Yard is groping in the dark, and has summoned you, the best detectives, for help in resolving their inquiries. 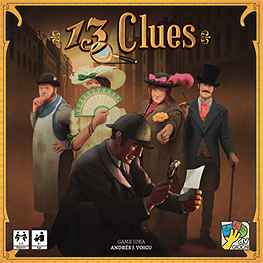 Each investigator will be assigned their own mystery to solve, and must use their instincts to identify which of the 13 Clues match their case - before the others do! Collects clues and rules out suspects to find the solution to their case: Who did it? Where? And what did they use?